The OPPO F11 Pro that was launched last month is now ready for a special edition. The F11 Pro Marvel's Avengers Limited Edition will come out the same day as the new Avengers movie — on April 24. Unfortunately, it might only be available in a limited number of markets, starting with Malaysia. While Google is busy adding Avengers Playmoji AR stickers to the existing collection that Pixel users have been able to enjoy for a while, OPPO is taking the upcoming launch of the "Avengers: Endgame" movie even more seriously — by gearing up for the release of a special edition F11 Pro handset that celebrates the new Marvel movie. The OPPO F11 Pro Marvel's Avengers Limited Edition is apparently nothing more than a regular F11 Pro — MediaTek Helio P70 processor, 6 GB of memory, 128 GB of internal storage space, a 6.53-inch full-screen display with 1,080 x 2,340 pixels, pop-up 16 MP selfie shooter, 48 + 5 MP main camera, 4,000 mAh battery, Android 9.0 Pie with ColorOS 6 on top — with a special Avengers-themed back cover. Obviously, it is very likely for the special edition OPPO F11 Pro to come with special wallpapers and accessories as well, but the details are still not public. 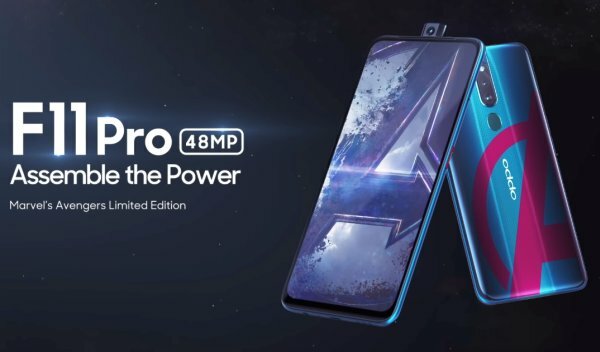 However, April 24 is not that far in the future, so we will get back to the OPPO F11 Pro Marvel's Avengers Limited Edition next week. Sadly, since this handset has been unveiled by OPPO Malaysia, it might be quite tricky to get one in other regions, so those who happen to be in the area later this month might want to get at least two or three units — after all, virtually everyone has at least one friend who loves Marvel's Avengers.